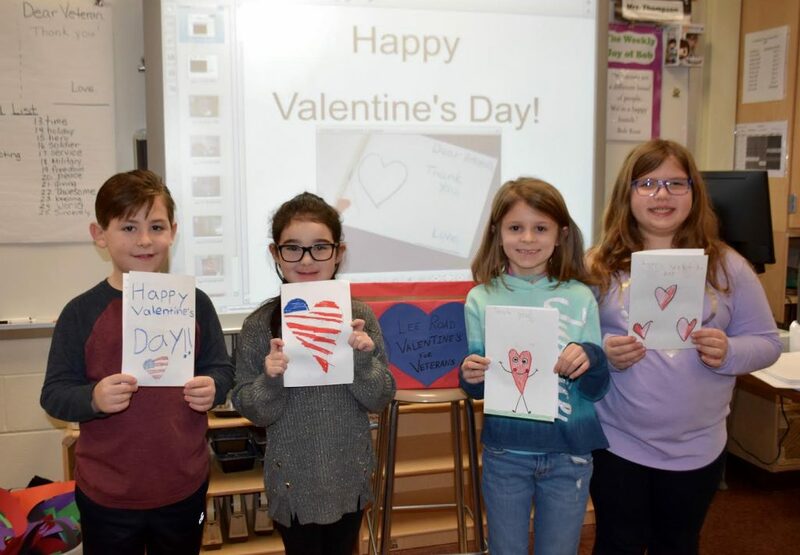 Lee Road Elementary School students in the Levittown Public Schools recently showed their appreciation by creating Valentine’s Day cards for local veterans. Coordinated by art teacher Saeeda Thompson, each class in the school worked on designing and writing cards during their art period for the Valentine’s for Veterans Card Drive program. The school, along with many others in the Levittown Public Schools, participate in the program each year to spread smiles to those who have served. The cards are sent to veteran centers across Long Island for the holiday. Before working on their cards, Thompson explained the meaning behind the project and spoke about what a veteran is. She also gave students some illustration ideas, provided examples of sentiments that they could include in their card, as well as some Valentine’s Day related jokes to put a smile on a veteran’s face. Students enjoyed designing, coloring and writing their cards and placed their finished project in a box with others from throughout the school. Nassau County Legislator Tom McKevitt picked up the hand-made Valentine’s Day cards to be distributed to the local veterans. 1) Lee Road second-grader Nicholas Coyle wrote a Valentine’s Day card to a veteran. 2) Lee Road second-grader Ava Malley showed her appreciation for veterans in her hand-made card. 3) Second-graders Adrianna Volin (left) and Matthew Sullivan worked on their cards. 4) (L-R) Lee Road second-graders Jayden Keinath, Kiley Mateiko, Brooke Squicciarini and Emma Hoffman with their completed Valentine’s Day cards for local veterans.